* Updated November 1, 2018, Thanks to some commenters below! This is going to be a (likely long-running, infrequently-appended) series of posts as I poke around in vmm. A few months ago, I demonstrated some basic use of the vmm hypervisor as it existed in OpenBSD 6.0-CURRENT around late October, 2016. We'll call that video Part 1. As good as the OpenBSD documentation is (and vmm/vmd/vmctl are no exception) I had to do a lot of fumbling around, and asking on the misc@ mailing list to really get to the point where I understand this stuff as well as I do. These are my notes so far. The system has an Intel CPU with a microarchitecture from the Nehalem family, or newer. (e.g. Westmere, Sandy Bridge, Ivy Bridge). Basically, if you've got an i5 or i7, you should be good to go. Your user-level account can perform actions as root via doas. See the man page for doas.conf(5) for details. Lines in blue are text inside configuration files. 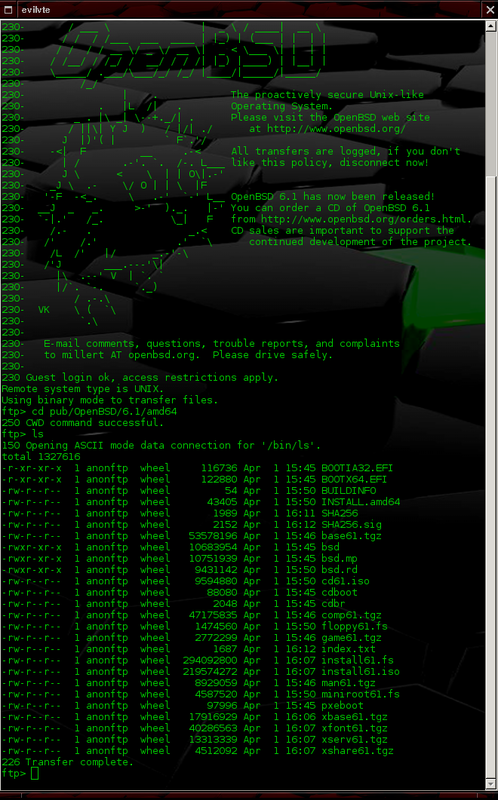 Lines in green are shell commands to be executed on the command line. Enable and start the DHCP server. We also need to set the flags on dhcpd so that it only listens on vether0. Otherwise, you'll end up with a rogue DHCP server on your primary network. Your network administrators and other users on your network will not appreciate this because it could potentially keep others from getting on the network properly. Enable vmd, then start it as well. For good measure, re-run fw_update to make sure you have the proper vmm-bios package. You should notice a new interface, likely named "bridge0" in ifconfig now. Create an empty disk image for your new VM. I'd recommend 1.5GB to play with at first. You can do this without doas or root if you want your user account to be able to start the VM later. I made a "vmm" directory inside my home directory to store VM disk images in. You might have a different partition you wish to store these large files in. Adjust as needed. Boot up a brand new vm instance. You'll have to do this as root or with doas. You can download a -CURRENT install kernel/ramdisk (bsd.rd) from an OpenBSD mirror, or you can simply use the one that's on your existing system (/bsd.rd) like I'll do here. The below command will start a VM named "test.vm", display the console at startup, use /bsd.rd (from our host environment) as the boot image, allocate 256MB of memory, attach the first network interface to the switch called "local" we defined earlier in /etc/vm.conf, and use the test image we just created as the first disk drive. You will also likely need to install packages without a prefetch area. Answer yes to this. After installation and before rebooting, I'd recommend taking note of the vio0 interface's generated MAC address (lladdr) so you can specify a static lease in dhcpd later. If you don't specify one, it seems to randomize the last few bytes of the address. Shut down the vm with "halt -p" and then press enter a few extra times. Enter the characters "~." (tilde period) to exit the VM console. Show the VM status, and stop the VM. I've been starting and stopping VMs all morning, so your VM ID will probably be 1 instead of 13. Now that the VM disk image file has a full installation of OpenBSD on it, build a VM configuration around it by adding the below block of configuration (with modifications as needed for owner, path and lladdr) to /etc/vm.conf. I've noticed that VMs with much less than 256MB of RAM allocated tend to be a little unstable for me. You'll also note that in the "interface" clause, I hard-coded the lladdr that was generated for it earlier. By specifying "disable" in vm.conf, the VM will show up in a stopped state that the owner of the VM (that's you!) can manually start without root access. Go ahead and reload the VM configuration with "doas vmctl reload", then look at the status again. I opted to set up a DHCP reservation for my VM so that I had a single IP address I knew I could SSH to from my VM host. This, to me, seems easier than using the VM console for everything. Add this clause (again, modified to match the MAC address you noted earlier) to /etc/dhcpd.conf. You have to place this above the last curly-brace. Go ahead and fire up the VM, and attach to the console. You'll see the seabios messages, the boot> prompt, and eventually, all the kernel messages and the login console. Log in and have a look around. You're in a VM! Make sure the interface got the IP address you expected. Ping some stuff and make sure NAT works. Again, you can use <enter>~. to exit the VM console. You probably want to log off before you do that. Go ahead and SSH in as well. The authenticity of host '10.13.37.203 (10.13.37.203)' can't be established. ECDSA key fingerprint is SHA256:f39GrAZouHQ3L+3/Qy3FHBma5K+eOe84B9QoFwqNpXo. Warning: Permanently added '10.13.37.203' (ECDSA) to the list of known hosts. One last thing I did was to port-forward SSH and HTTP (on high ports) to my VM so that I could get to the VM from anywhere on my home network. Add these lines to /etc/pf.conf directly under the vmd NAT rule we added earlier. You should now be able to ssh to port 2200 on your host VM's IP. Obviously, browsing to port 8000 won't work until you've set up a web server on your VM, but this was how I started out when working on the PHP/MySQL guides. I've stopped maintaining the page for nginx because it hasn't received many views since I updated it about six months ago. I suspect that nginx on OpenBSD is not all that popular because the httpd that ships with OpenBSD provides almost the same functionality as a basic installation of nginx. The pages for httpd in base and Apache2 now cover PHP7 and both configurations appear to work really well. Feel free to comment on this post if you find any discrepancies or have suggestions. Comments are disabled on the walk-through pages. (2017-04-23) Edited to add: I went ahead and re-worked the nginx guide, based on the httpd guide with new formatting. Edited to add: The OpenBSD 6.1 release page has been changed. It's official.